I decided to teach myself how to work with big data and came across Apache Spark. While I had heard of Apache Hadoop, to use Hadoop for working with big data, I had to write code in Java which I was not really looking forward to as I love to write code in Python. Spark supports a Python programming API called PySpark that is actively maintained and was enough to convince me to start learning PySpark for working with big data. In this post, I describe how I got started with PySpark on Windows. My laptop is running Windows 10. So the screenshots are specific to Windows 10. I am also assuming that you are comfortable working with the Command Prompt on Windows. You do not have to be an expert, but you need to know how to start a Command Prompt and run commands such as those that help you move around your computer’s file system. In case you need a refresher, a quick introduction might be handy. Often times, many open source projects do not have good Windows support. So I had to first figure out if Spark and PySpark would work well on Windows. The official Spark documentation does mention about supporting Windows. PySpark requires Java version 7 or later and Python version 2.6 or later. Let’s first check if they are already installed or install them and make sure that PySpark can work with these two components. Java is used by many other software. So it is quite possible that a required version (in our case version 7 or later) is already available on your computer. To check if Java is available and find it’s version, open a Command Prompt and type the following command. If Java is installed and configured to work from a Command Prompt, running the above command should print the information about the Java version to the console. For example, I got the following output on my laptop. Go to the Java download page. In case the download link has changed, search for Java SE Runtime Environment on the internet and you should be able to find the download page. Accept the license agreement and download the latest version of Java SE Runtime Environment installer. I suggest getting the exe for Windows x64 (such as jre-8u92-windows-x64.exe) unless you are using a 32 bit version of Windows in which case you need to get the Windows x86 Offline version. After the installation is complete, close the Command Prompt if it was already open, open it and check if you can successfully run java -version command. Python is used by many other software. So it is quite possible that a required version (in our case version 2.6 or later) is already available on your computer. To check if Python is available and find it’s version, open a Command Prompt and type the following command. If Python is installed and configured to work from a Command Prompt, running the above command should print the information about the Python version to the console. For example, I got the following output on my laptop. Go to the Python download page. Click the Latest Python 2 Release link. Download the Windows x86-64 MSI installer file. If you are using a 32 bit version of Windows download the Windows x86 MSI installer file. 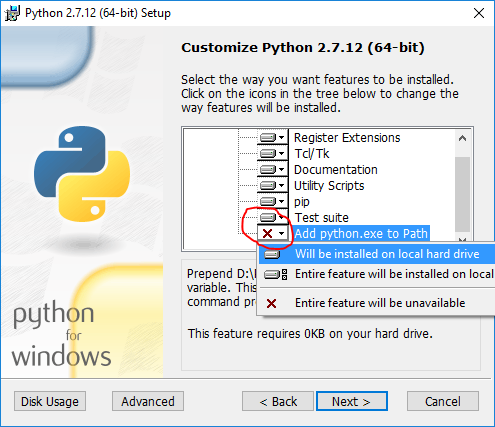 When you run the installer, on the Customize Python section, make sure that the option Add python.exe to Path is selected. If this option is not selected, some of the PySpark utilities such as pyspark and spark-submit might not work. After the installation is complete, close the Command Prompt if it was already open, open it and check if you can successfully run python --version command. Go to the Spark download page. For Choose a Spark release, select the latest stable release of Spark. For Choose a package type, select a version that is pre-built for the latest version of Hadoop such as Pre-built for Hadoop 2.6. For Choose a download type, select Direct Download. Click the link next to Download Spark to download a zipped tarball file ending in .tgz extension such as spark-1.6.2-bin-hadoop2.6.tgz. In order to install Apache Spark, there is no need to run any installer. You can extract the files from the downloaded tarball in any folder of your choice using the 7Zip tool. Make sure that the folder path and the folder name containing Spark files do not contain any spaces. In my case, I created a folder called spark on my C drive and extracted the zipped tarball in a folder called spark-1.6.2-bin-hadoop2.6. So all Spark files are in a folder called C:\spark\spark-1.6.2-bin-hadoop2.6. From now on, I will refer to this folder as SPARK_HOME in this post. To test if your installation was successful, open a Command Prompt, change to SPARK_HOME directory and type bin\pyspark. This should start the PySpark shell which can be used to interactively work with Spark. I got the following messages in the console after running bin\pyspark command. 16/07/09 15:44:11 INFO Utils: Successfully started service 'sparkDriver' on port 53607. 16/07/09 15:44:11 INFO Utils: Successfully started service 'sparkDriverActorSystem' on port 53620. 16/07/09 15:44:11 INFO Utils: Successfully started service 'SparkUI' on port 4040. 16/07/09 15:44:11 INFO Utils: Successfully started service 'org.apache.spark.network.netty.NettyBlockTransferService' on port 53657. The last message provides a hint on how to work with Spark in the PySpark shell using the sc or sqlContext names. For example, typing sc.version in the shell should print the version of Spark. You can exit from the PySpark shell in the same way you exit from any Python shell by typing exit(). The PySpark shell outputs a few messages on exit. So you need to hit enter to get back to the Command Prompt. Starting the PySpark shell produces a lot of messages of type INFO, ERROR and WARN. In this section we will see how to remove these messages. This error message does not prevent the PySpark shell from starting. However if you try to run a standalone Python script using the bin\spark-submit utility, you will get an error. For example, try running the wordcount.py script from the examples folder in the Command Prompt when you are in the SPARK_HOME directory. 16/07/09 16:23:28 INFO Utils: Successfully started service 'sparkDriver' on port 59506. 16/07/09 16:23:28 INFO Utils: Successfully started service 'sparkDriverActorSystem' on port 59519. 16/07/09 16:23:28 INFO Utils: Successfully started service 'SparkUI' on port 4040. 16/07/09 16:23:28 ERROR SparkContext: Error initializing SparkContext. 16/07/09 16:23:29 INFO MapOutputTrackerMasterEndpoint: MapOutputTrackerMasterEndpoint stopped! 16/07/09 16:23:29 INFO OutputCommitCoordinator$OutputCommitCoordinatorEndpoint: OutputCommitCoordinator stopped! 16/07/09 16:23:29 INFO RemoteActorRefProvider$RemotingTerminator: Shutting down remote daemon. 16/07/09 16:23:29 INFO RemoteActorRefProvider$RemotingTerminator: Remote daemon shut down; proceeding with flushing remote transports. py4j.protocol.Py4JJavaError: An error occurred while calling None.org.apache.spark.api.java.JavaSparkContext. 16/07/09 16:23:29 INFO RemoteActorRefProvider$RemotingTerminator: Remoting shut down. Let’s download the winutils.exe and configure our Spark installation to find winutils.exe. Create a hadoop\bin folder inside the SPARK_HOME folder. Download the winutils.exe for the version of hadoop against which your Spark installation was built for. In my case the hadoop version was 2.6.0. So I downloaded the winutils.exe for hadoop 2.6.0 and copied it to the hadoop\bin folder in the SPARK_HOME folder. Create a system environment variable in Windows called SPARK_HOME that points to the SPARK_HOME folder path. Search the internet in case you need a refresher on how to create environment variables in your version of Windows such as articles like these. Create another system environment variable in Windows called HADOOP_HOME that points to the hadoop folder inside the SPARK_HOME folder. Since the hadoop folder is inside the SPARK_HOME folder, it is better to create HADOOP_HOME environment variable using a value of %SPARK_HOME%\hadoop. That way you don’t have to change HADOOP_HOME if SPARK_HOME is updated. 16/07/09 16:37:52 INFO Utils: Successfully started service 'sparkDriver' on port 62029. 16/07/09 16:37:52 INFO Utils: Successfully started service 'sparkDriverActorSystem' on port 62042. 16/07/09 16:37:53 INFO Utils: Successfully started service 'SparkUI' on port 4040. 16/07/09 16:37:53 INFO Utils: Successfully started service 'org.apache.spark.network.netty.NettyBlockTransferService' on port 62079. The bin\spark-submit utility can also be successfully used to run wordcount.py script. Copy the log4j.properties.template file in the SPARK_HOME\conf folder as log4j.properties file in the SPARK_HOME\conf folder. Now any informative messages will not be logged to the console. For example, I got the following messages after running the bin\pyspark utility once I configured the log level to WARN. In order to work with PySpark, start a Windows Command Prompt and change into your SPARK_HOME directory. To start a PySpark shell, run the bin\pyspark utility. Once your are in the PySpark shell use the sc and sqlContext names and type exit() to return back to the Command Prompt. I used the following references to gather information about this post. Downloading Spark and Getting Started (chapter 2) from O’Reilly’s Learning Spark book. Any suggestions or feedback? Leave your comments below.